Eisstock, also known as Bavarian Curling, is a winter sport, often played on frozen lakes as a weekend entertainment or in competitions on official ice tracks. It is a sport most popular in Germany, Austria, Switzerland and Südtirol, as well as some other European countries. As the name suggests, it is very similar to another well-known sport, curling. Although originally founded and imported from Scotland, curling is nowadays most practiced in Canada. Despite the similarity, there are some significant differences between Curling and Eisstock, and this post will focus on the latter. It is commonly accepted that Eisstock Curling had its origins in Scandinavia in the13th century. The earliest paintings portraying a similar sport are from Holland and from the Alps. It is important to keep in mind that painters and artists at that time used to travel a lot, and historians believe it is likely that they got the inspiration for their Eisstock Curling paintings from the Alps and not from Holland, making the Alps the true origin of Bavarian Curling. However, the exact origin shall remain disputed. What we do know for sure is that the first curling clubs were created prior to the 20th century and in 1951 the first European Championship was held in Garmisch-Partenkirchen. The first world championships were held in Frankfurt am Main in 1983. It was also presented as a demonstration event in the 1936 Winter Olympics in Garmisch-Partenkirchen, but efforts to make it a regular competition discipline at the Olympic games have not yet been successful. An International Federation for Ice-Stock-Sport (IFI) was established before the first world championship in 1983. The IFI established and published the official rules for Ice-stock-sport, by which the international games are bound. The official rule book can be accessed here. (a target object set up in the middle of the target field). Each player gets one shot per match and each game consists of 6 rounds. The target (Daube) may be shifted from its original spot if hit by one of the stocks. This is allowed, as long as the Daube remains in the target field. Should the Daube be pushed out of the target field it must be returned to its original spot. The team with the stock closest to the Daube wins the game and takes home the Eisstock trophy! Target Competition can be a team game or an individual contest. There are a couple of variations in this game as well, but as the name suggests, it is a target competition. There are 4 different stages/durations of the game and each stage has a slightly different rule. They consist of some form of target shooting, although the positions, the distance and the launching rules may vary. ect leaves the lane is where the distance is measured. This game is usually played as an individual competition, but can also become a team effort by summing up the distances achieved by the different players. y player throws the same object, but is allowed to use his own launching stock. The players are allowed to gain momentum and speed by running a few meters before throwing the stock, which can really make the difference for a skilled player. Although it is mainly played in northern European countries, this sport is becoming increasingly popular and practiced not only in the winter, but year round on artificial or plastic ice tracks. Unfortunately many fake ice tracks do not use premium quality materials and don’t have the newest technology incorporated, making a big difference for the players. Therefore, many players have resorted to non-ice curling tracks. While this is a viable alternative it kind of defeats the purpose of Eisstock Curling. Fortunately there are high quality synthetic ice Eisstock tracks that allow competitors to practice year round without any inhibition or discomfort. 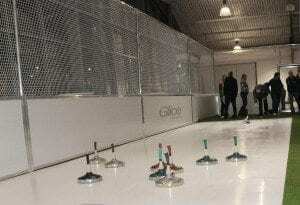 Glice® prides itself in producing ice tracks that create an ice-like response for avid curlers. Our plastic ice is built with an especially high molecular structure and is known for its durability despite heavy use over the years. Glice® synthetic ice is available in different sizes and shapes, depending on your need and preference. 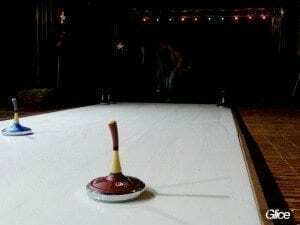 It is popularly used for Eisstock curling schools, clubs, camps, events and family getaways among other things. The best thing about artificial ice tracks is that they are not seasonal and can be used all year long as a source of entertainment for families or a healthy competition between friends. 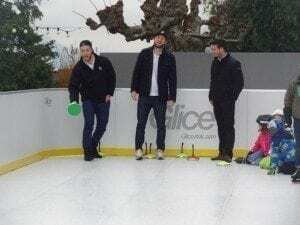 Glice® synthetic ice tracks are incredibly practical and easy to install. We have experts available to advise you on the best option for you. 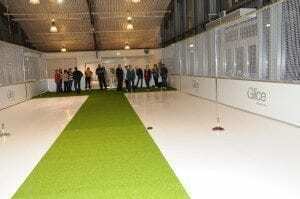 Contact us today and get your very own synthetic Eisstock Curling Track.